A revolutionary, rich hydrating cream offers powerful anti-aging and skin healing benefits. 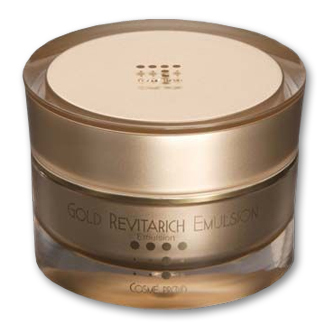 Gold Revitarich Emulsion deeply penetrates the skin using nanoized negative ions from pure 24K Gold and delivers an amazing combination of active ingredients that include Argireline, Pycnogenol, Hyaluronic Acid, Horse Chestnut, Aloe Vera, Squalene, Oenothera Biennis Seed, Hydrolyzed Hibiscus Esculentus Seed and other natural plant extracts. Regular use, combined with the other exceptional products in this line, offers the ultimate in improved texture, tone and a radiant, clear complexion. Use as a final step in the daily Cosme Proud skin care routine. Apply Gold Revitarich Emulsion to the face and neck. Start with a small amount because this formula is highly spreadable and rich. Use morning and night.